Return to the enthralling world of the Picts and THE WARRIOR BROTHERS OF SKYE series in this novella set in Dark Ages Scotland. A storm brings them together, but the world beyond threatens to force them apart. Erea lives alone in the wilderness. Years earlier her mother was accused of witchcraft and banished from her home. Now her mother’s dead, and Erea must fend for herself. But her solitary existence shatters the day a handsome stranger knocks on her door in a snowstorm. Tadhg mac Fortrenn never expected to find a comely young woman living alone in the wild while he was out deer hunting. The son of The Stag chieftain, he is used to women succumbing to his boyish charm--yet Erea seems immune. Trapped together inside during a bitter snowstorm, Erea and Tad start to realize that this chance meeting will change their lives forever. In the days that follow, they discover that the hottest fires burn in the depths of winter. Only, as the mid-winter solstice approaches, outside forces put their happiness in peril. WINTER'S PROMISE is a stand-alone festive novella, set in ancient Isle of Skye, Scotland. A heartwarming Christmas read, this story is about discovering the truth, and facing the past. Click 'BUY NOW' and immerse yourself in the magic of a Pictish mid-winter! This is the first book I've read by Jayne Castel and I'm hooked, can't wait to read more. Twists I didn't see coming, this book reminds us that with forgiveness can come new beginnings and healing. I love reading these dark ages novels. I found the characters to be interesting. Jayne Castel books are very descriptive and with little written about this period in time she weaves a wonderful story incorporating as much historical accuracy as available. The Warrior Tad is an amusing, somewhat opinionated warrior. Tad finds the fiery girl different from any girls he knew. They became drawn to each other as they got to know each other while they were stranded in a mid winter blizzard. Erea was used to.living alone so Tad's arrival made her feel uncomfortable at first. Obviously they fell in love and stood together against all odds. Fun book to read and true to Jayne Castel 's style, which I really enjoy reading. 4.0 out of 5 starsAll Castel's signature storytelling in short form! Looking for a historical novella that has a little bite and edge to go with the sweet? Then this quick read by Jayne Castel might fit the bill. When the holidays come around, sometimes I have a hard time concentrating on a long, involved novel, but I can be turned off by the saccharine sweet novellas that a lot of my favorite historical authors pump out this time of year. 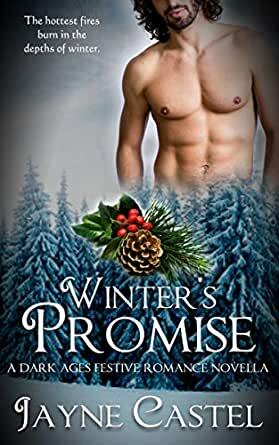 Castel's Winter's Promise is in her Warrior Brothers of Skye world (Dark Ages Scotland), but doesn't really involve the main characters from that series, making it a VERY approachable independent novella. Like many of Castel's heroes, there is some growing and maturing to do. Given the novella length, pretty boy and privileged (as far as privilege can go in 1st century Britain) Tad finds his lady love in an isolated woods. Eara is alone and lonely, and beautiful Tad fills her winter days in a way she couldn't imagine. However, dark secrets threaten their happiness, along with expectations of his role as heir to the clan. Likable characters, buffeted by circumstances which may condemn them, add some taut moments to the story. If you have enjoyed ANYTHING by Jayne Castel, definitely pick up this novella. If you simply like a historical story that won't bury you in sweet or too much intrigue at a busy holiday season, pick it up as well.